“Her children arise and call her blessed; her husband also, and he praises her: ‘Many women do noble things, but you surpass them all…’ Give her the reward she has earned, and let her works bring her praise at the city gate” (Proverbs 31:28-31). Although this blog is finally only being posted on January 1, 2011, it was conceived in my soul on December 31, 2010. 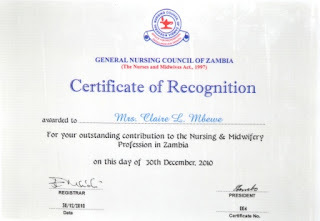 This was because, on the previous day (December 30), I was asked to receive a certificate of honour on behalf of my mother at the 40th anniversary celebrations of the General Nursing Council of Zambia at the Mulungushi International Conference Centre here in Lusaka. As the thoughts ignited by this award-giving ceremony brewed in my soul, I felt compelled to put pen to paper and express them through this blog. 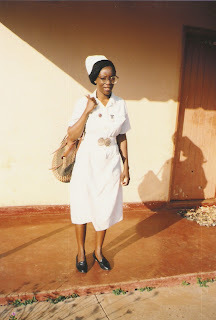 This blog, therefore, is not primarily about my mom as a wife and mother in the home—that would need another blog entry to deal with—but about her as a nurse and the impact her nursing career left on me, on my siblings, and on the nation of Zambia. My mother, Mrs Claire Linda Mbewe (neé Kawandami), found herself in this book because she was a pioneer of nursing in Zambia. 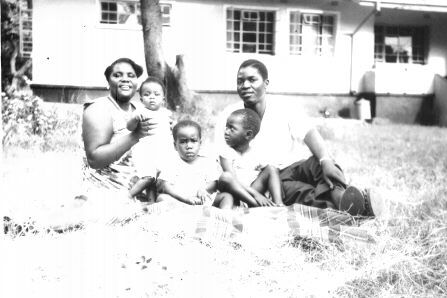 When she commenced work in 1958 in Ndola she was only the second professional nurse in Zambia. She graduated in South Africa as a Registered Nurse after a Mrs K Sikota, the first Zambian Registered Nurse, who preceded her six years earlier in 1952. At the University Teaching Hospital (called ‘Lusaka Central Hospital’ in the short biographical sketch above), mom worked as Senior Nursing Officer, which was the top nursing position in the whole hospital. She moved to the Ministry of Health in 1969 and became the Chief Nursing Officer in charge of all nursing services in the nation. When she died, at the age of 37, she had just moved to Cabinet Office. She went to her reward still young and full of zest. Why did the General Nursing Council (GNC) give mom an award almost forty years after her death? Well, there is no doubt that she played a very significant role in the establishment of nursing in Zambia. But more than that, when the GNC was formed by an Act of Parliament in 1970—giving nurses a distinct legal place in health care—mom was in charge of all the nursing services in the nation. So, there is no doubt that she played a vital and pivotal role in its establishment. 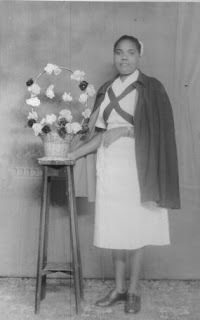 A year after her death the Zambia Nurses Association (now called the Zambia Union of Nurses) erected her tombstone, showing the high esteem that mom enjoyed among the nursing fraternity in the whole country at the time of her death. When mom died, I was only nine years old. I did not understand what death was. To me, she had gone on a long journey and would return one day. Well, this year (2011) marks forty years since my mother went on that journey—and she has not returned. Being almost fifty years old now, I now understand that she will never return. Rather, I will go and join her very, very shortly. I said that I was only nine years old when my mother died. I have one negative recollection of her as a nurse—only one. 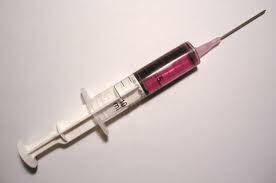 It was the times she gave me injections when I was ill. I recall once telling her in between sobs—as I kicked and screamed—that I would never fall sick again if she desisted from giving me an injection. I do not think she took my promise seriously because she still went ahead and pricked me with it, while dad held me down on the bed. Forty years later, I still hate those injections! One more matter needs mentioning in this blog written in honour of my mother. 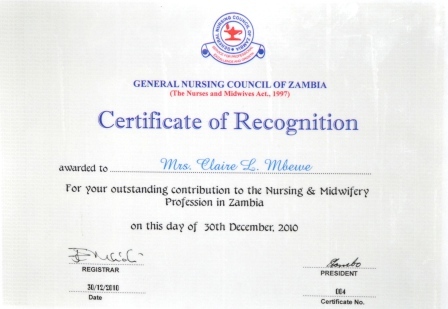 It was because of mom’s passion for nursing that her surviving siblings and children felt obliged in 2004 to introduce the Claire Linda Mbewe Memorial Award which is given to the most deserving graduate of the Lusaka School of Nursing each year. Whereas it competes favourably with one or two other awards as far as prize money is concerned, it is presently the most coveted trophy because it is the only floating trophy that has a miniature trophy which the recipient keeps. We also provide a one paged laminated biographical sketch of mom’s nursing career to the recipient. 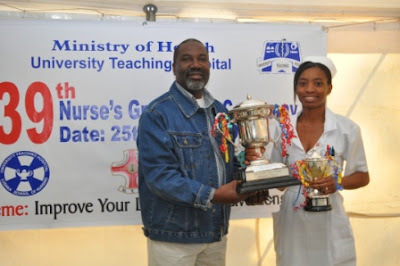 Our desire as a family is that newly qualified nurses starting the journey that mom once trod with this award in their possession would find in her example a role model to emulate until God also calls them from this life. As a family, we felt that this was the least we could do in honour of this pioneering woman who blazed a trail for professional nursing in Zambia. Indeed, “[we] arise and call her blessed..., and [we want] her works to bring her praise at the city gates.” Amen! The impact of mom’s nursing career is still evident in the family. My elder sister, Dr Mwape Kabole, who is a Consultant Paedriatrician, presently practicing in England, was only eleven years old when mom died. Yet she testifies that she took up medicine as a career primarily because of mom’s example. I also seriously considered a medical career but the sight of blood still gives me the creeps. We spent long hours with my elder sister, as she assured me that you soon get used to it. In the end I took up Mining Engineering because rocks don’t bleed! However, all was not lost, because when I met a nurse with godly virtue (Felistas) soon after graduating from university, I married her! I must state my position(which might appear more like surfacing out of the woodwork).Having grown up under Mrs Claire Linda Mbewe from the age of about three to the time that she died when i was about seven that I was fortunate to have had my earlier years as a young person moulded largely by Mrs Claire Linda Mbewe(Grand mother) . 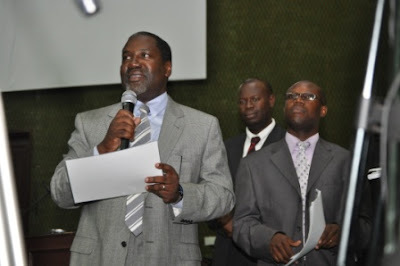 (Though this blog does not touch on that aspect of the role she played as mother)I believe that had the blog touched on her aspect as a mother my name would have inevitably have popped up.Non the less I should briefly state that as a mother she was mother to not only three children("Thamara Mwape, Conrad Chanda, Irene Mukalo") but to fourth child Myself (-Musa Phiri).From an early age of three.What I recall about her character was her hard work.I also remember how she was extremely interested in my educational development.Also inside her was a selfless character such that It was not until I was about five years old (that due to the visits that my biological father would make) that i discovered that she was actually Grand Mother and not my real bological mother (all along I had sincerely believed that she was my biological Mother) . She was a very strong woman. I recall just before she died the trips that she undertook to most of the rural parts of Zambia educating families about the alternative of soya beans as a dietary supplement in poor house holds. She was gone for long periods to these rural areas.It was more like the "leader folding sleeves to demonstrate how the detailed tasks are carried out".From early child hood I also remember that she was very particular about eating habits and how between meals we were not allowed to eat stuff which will spoil the appetite by the time you get to your next meal.Perhaps a small part of her character did rub in on me.My wife (Stella) and I have proudly named our second born daughter after Mrs Claire Linda Mbewe (Claire).This blog has been a great opportunity to explain to my daughter and others in my house hold where the name Claire comes from. Oh yes when you name a child you do not do so carelessly. For a person with as much gifting and as much fruit as yours, it is further edification to read about your family and get glimpses of those the Lord used to set your compass. I was very encouraged, reading about your mother's nursing career. Great in sequence! 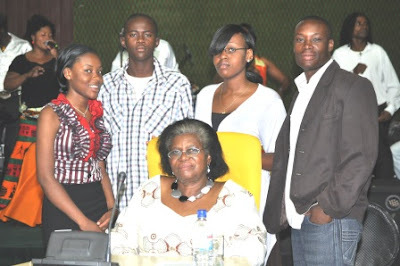 There is something wonderful concerning "In Honour of My Mother—Claire Linda Mbewe ". I am impressed by the excellence of information on this website. There are a bundle of good quality resources here. I am sure I will visit this place another time soon. click here. My name is Galefele Molema a board member at Tiger Kloof Educational Institution. I am pleasantly surprised by what read about Claire Linda Mbewe, I currently doing research about former students of Tiger Kloof Educational Institution, who came from outside South Africa. I am would like included her life story and achievement in my writings and also make the school aware of her. I believe she is a very note worthy graduate of the historic Tiger Kloof Educational, more so she also represents the great achievements of woman alumni of the institution. Do you know any other Zambians who attended school at Tiger Kloof Educational Institution before or after Claire Linda Mbewe's time at the school? Kindly provide their names so we acknowledge them in the alumnus name list. My name is Galefele Molema, I am board member at Tiger Kloof Educational Institution. Whilst doing online research about the alumnus of our alma mater, I came across your website http://www.conradmbewe.com/ and was pleasantly surprised by what I read about you later mother. She was a great woman and achieved a great deal, well, I never knew of her before I read article on your website. Her life story is a great testament to the fact women can still be mothers and have fulfilling careers, she is also a note worthy alumni of our historic school. Currently the school's history only acknowledges the achievements of mainly men (like Seretse Khama, first President of Botswna) and the is only one woman (Ruth Mompati) from our alumnus, who is acknowledge. I would like to change this and have a fair representation of our mothers in the list. Claire Linda Mbewe should be acknowledged in our school's history and I would like to add her to the list of our old alumnus. May you kindly send me more details on her life and education in South Africa and in Zambia. Do you know of any other Zambians who attended school with your mother at Tiger Kloof? Kabwata Baptist Church Clocks 25 Years Today! On which Tablet is the Fifth Commandment?